Biking in Bend is pretty great. But there are a lot of hills. A LOT of hills. 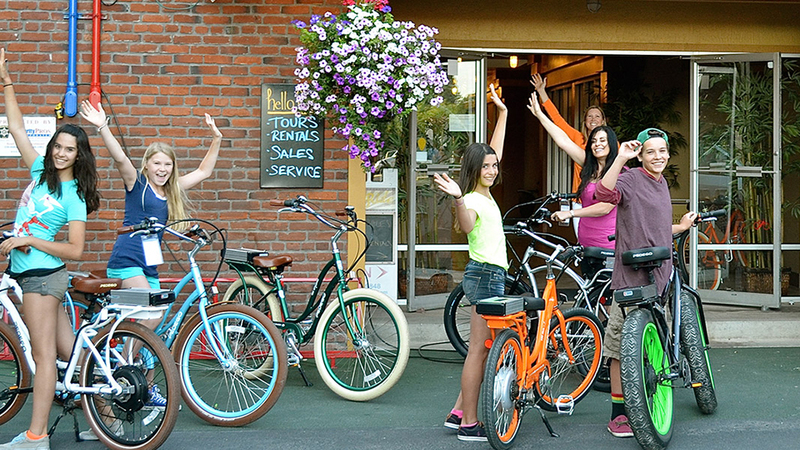 Electric bikes from Let It Ride Bikes let you cruise all around town (down AND up) with ease. Let It Ride Bikes proudly features Pedego bikes, the number one rated eBikes in the United States, and you can rent and ride them on your own or have Let It Ride be your guide. Should you choose the former, tandems, cruisers, fat tires, and trail bikes will have you easing down the road or trail as you effortlessly explore this fair town. They also rent trailers for kiddos and dogs…because no one wants to get left behind! Let It Ride also has a number of tours to choose from. The Short and Sweet Tour will take you around the bend and back in just 90 minutes, and if you’re staying on the Westside they’ll even provide door to door service. On the Bend Brewery Tour, you’ll pedal to three or four of Bend’s finest breweries, with tastes at each stop included. Whether you choose a self-directed tour or take a guided option, exploring on an eBike from Let It Ride gives you an up-close, personal experience you just can’t get any other way.